â€œIn Xolobeni we live in a very traditional way that one can never be compensated for if one is ever removed from the land of their forefathers. We are one community that’s bound by humanity,â€ said Nonhle Mbuthuma, the Amadiba Crisis Committee (ACC) spokesperson, to the Daily Vox in an interview. 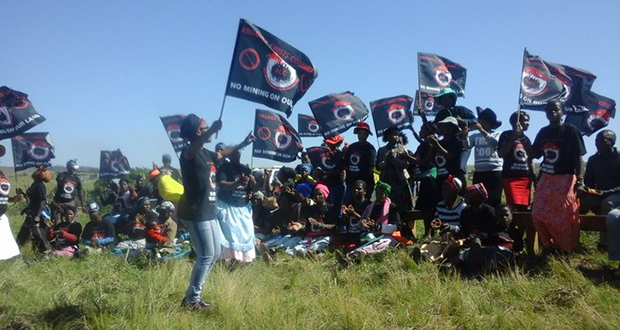 A decades-long mining dispute between the people of Xolobeni (on the Wild Coast of the Eastern Cape) and the department of mineral resources, which is backing the Australian mining company Transworld Energy and Minerals (TEM), continues. TEM, a subsidiary of the multinational mining company Mineral Commodities Ltd (MRC), has been attempting to gain a mining licence to exploit the titanium in the sand dunes along the coast. However, the licence has been opposed in court by community groups including the ACC. Over the weekend, the mineral resources minister Gwede Mantashe visited the area in an attempt to quell the tensions. However, his overtures were rebuffed. Grateful for the attention on @Richard_Spoorâ€™s arrest, but real focus should be on police chasing Xolobeni community away from meeting about their own land. Nonhle Mbuthuma was targeted and tear gassed in the face – she is still taking medication to recover. According to ACC spokesperson Nonhle Mbuthuma, the meeting held by Mantashe was unnecessary and exclusive of the community members. â€œThere was no need for Gwede Mantashe to come here ahead of the judgement. Also, the programme of that meeting was a long list of politicians, clearly they were here to lecture us and not hear our own views,â€ Mbuthuma said. The Sunday Times reported that the department of mineral resources said Mantasheâ€™s weekend visit formed part of the â€œongoing frank and open discussionsâ€ with mining companiesâ€š communities and other stakeholders â€œto rebuild relationships and levels of trustâ€. However, the meeting ended abruptly after chaos erupted when a lawyer representing the communities Richard Spoor reportedly confronted Mantashe, and was arrested. â€œWhen the trucks actually come into the area and the implementation begins, that will be an extension of the legal deprivation into physical deprivation,â€ he said. Mbuthuma says the people are waiting for the judgement to be made and are ready to appeal should it be in favour of the DMR. â€œWe are waiting for the court judgement and if it is in favour of the DMR, we will continue to appeal as far as constitutional court. Even if the constitutional court says we have no right to appeal we won’t stop fighting. â€œAt the end of the day we are talking about people’s lives being at risk here. The consequences of the mining will affect us and nobody else. It is going to destroy our land, the same land that we use for agriculture,â€ she said. In March 2016, them chairperson of the ACC at the time Sikhosiphi â€œBazookaâ€ Rhadebe was assassinated. He was among firm opposers of the mine development and it was alleged that before his death, he had discovered a hit list of mine opponents, with his name first on the list. Mbuthuma said blood has been shed before and none of the intimidation could deter them anymore. â€œThe state of South Africa must understand that we made it clear that we don’t want any benefits from the,mining, we simply said no. â€œAccording to what I’ve witnessed, history always repeats itself. Our forefathers defended and protected land in the 1960 and blood was shed. After 1994, I’m still here fighting and defending land for the future generation and blood is still being shed. But just like our forefathers never gave up, we won’t give up. â€œWe are no longer fighting this battle for ourselves but for our children, if it means we sacrifice our lives just to protect this land for them we will do that,â€ said Mbuthuma. She added that due to the life they have always known of sharing laughter and farming as a community and neighbours. â€œNo amount of money would compensate the life full of humanity and human value. Even if they build a double storey in compensation, it won’t bring back the meaningful life of love and sharing,â€ she said.